Teaching responsibility with easy chores for kids is something that I feel is important. Not only does it help them to understand what it takes to make a household run, it helps them learn that they should take care of their own belongings so they aren't damaged. To me, this is a win-win situation that is long lasting in teaching my children essential daily living skills and being respectful of people's belongings. Sorting Laundry. Even the youngest kids can help with this simple chore. It's an excellent teaching tool for colors. Have them sort the whites from darks, or simply sort their clothing out of the hamper for separate loads for each family member. If they aren't old enough for that, you can teach them to put their dirty clothing in the hamper after they change clothing each day. Another option is to invest in sorting hampers to help make it easy for kids to sort their clothing on a regular basis. Putting away their laundry. Even the youngest kids can help carry their laundry to their rooms to put back into their drawers when they are cleaned. Some items that need to be put into closets may require assistance, but you may also consider lowering the closet rods to make it easier for shorter children to hang their laundry as needed. If they have a dresser in their room, you may find our tips on teaching kids how to organize their clothes plus printable drawer labels to be helpful. Feeding pets. Making sure pets have water, kibble, or even wet food each day is something most kids can easily assist with. This is one of the best chores for kids to begin with since they want to be responsible for something in their home. As they get older you can also have them take over things like walking the dog, cleaning up after accidents, or even scooping the litter pan for your cats. Setting the table for meals. If you have family meals together, this is a simple chore that kids can learn from an early age. Set up a routine of items that are put at the table for every meal, and offer your kids options for things that are safe for them to set out. Grab paper or plastic plates and cups for younger kids to practice with instead of your better dinnerware. As they get older they can be more comfortable setting the table with the quality plates and utensils. Gathering trash. If your kids have trash cans in their bedroom or bathroom, they can easily help gather trash for the times when garbage should be taken out. As they get older, this is one of the best chores for kids to take over completely. Older kids can easily empty all household trash and make sure the dumpster is at the curb each week for pick up. Keeping their room clean. While younger kids may not be able to do everything, they can learn from an early age to put things away and make sure their bedrooms are cleaned up. You can teach them how to pull their blankets up and arrange their pillows each day to make their bed even as a toddler. Another great bedroom cleaning option is to have them help with dusting or vacuuming as needed. 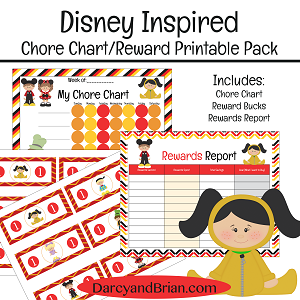 Download your printable Disney inspired chore chart for kids! 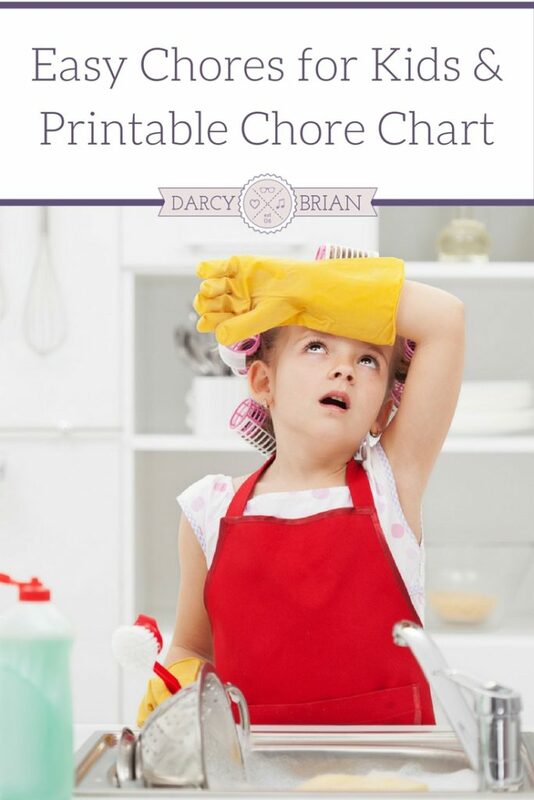 Subscribe to receive your chore chart printable pack, and access to our latest printables. These easy chores for kids are a great beginning to teaching them responsibility around the house. Not only will these things help ease your household chore burden, they will also build an understanding in your kids about what it takes to run a household. Love this article! 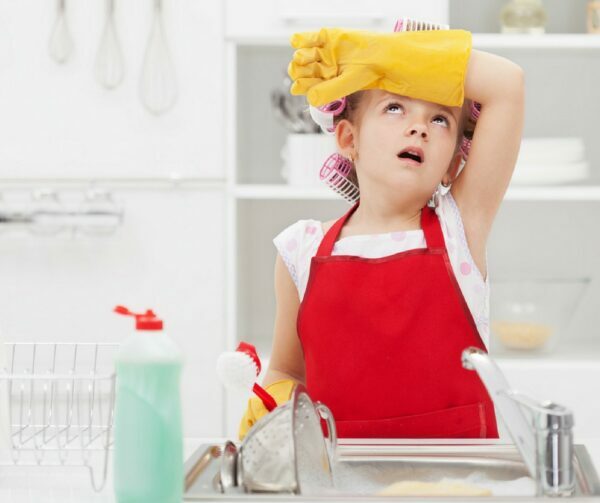 Teaching children to do little chores as they grow up helps them to be accustomed to helping to tidy up after themselves and to be responsible. I’m a professional organizer and find myself teaching some young adults how to do simple chores because they were never taught these things as young children. Check out my children’s books: Suzie’s Messy Room and Benji’s Messy Room. These books guide children through the process of picking up their room after they’ve had lots of fun playing with their toys. Great ideas here!! I love that you included a printable as well. We have also had our children involved around the house with chores. It amazing as they get older and they do it on their own and they really see the value in taking part of the home and keeping their items cleans. Oh yes, I love when the kids take the initiative to do their chores. It’s funny because my daughter loves to help with almost everything except putting her clothes away. My son has totally owned putting away silverware from the dishwasher. He will announce that he needs to do his chore before he’s told. Thanks for stopping by, Lindsay!